Stay updated on new features and enhancements in QuickBooks Online! Here are the changes, improvements, and fixes we made this year. We’ve made adding bank and credit card transactions, connecting your accounts online, and reconciling transactions easier than ever! You can now match transactions that are up to 5% larger than the deposit amount from your bank and create more than one transaction to resolve match difference. When splitting an expense transaction, you can mark it billable to more than one customer. Don't like QuickBooks automatically matching transactions for you? You can now turn off Auto-recall for Bank Feed transactions. We've made connecting your accounts a lot easier! You can now connect your bank account without going through the Banking setup workflow. See Add and connect your bank and credit card accounts for detailed steps. With Cleared Date Intelligence, Reconciling your bank account is smarter and easier than ever! If your account is connected to online banking, you'll see a Cleared Date column which comes from your bank and represents the date the transaction cleared the bank. You will be alerted when there are transaction date and transaction cleared date discrepancies so you can easily find problem transactions. Instead of always showing the "Select existing payments to add to this deposit" at the top of the Bank Deposit transaction, it will only be shown if there are payments or sales receipts in Undeposited Funds. This enhancement makes it easier for you to see the Bank Deposit transaction and efficiently enter data into the deposit screen. To give you a better "Manage Users" experience, we are launching changes to the way users and permissions are set up in QuickBooks Online. With Progress invoicing, you can now create multiple invoices from an estimate so you can easily keep track of the progress of a particular job/project. You can now do job costing in QuickBooks Online through Projects. Using QuickBooks Online Projects, you can easily organise all the pieces that make up a job including transactions, time, and running reports so you always know how your project/job is doing. Sending invoices and other forms within QuickBooks Online gets more exciting with redesigned templates and additional features to ensure your email is delivered on time! The updated invoice email highlights the business brand, lets you have easier and quicker access to invoice details and provides a more mobile responsive view of the invoice.To learn more, see Redesigned Invoice Email. We continue to improve import/export experience so you can move data from, to, or within QuickBooks Online without a sweat! We've added bank transactions in the Import Data window making it easier for you to find the option to import transactions downloaded from your bank in CSV format. Just select the Gear then Import Data and choose Bank Data. You can now import subaccounts without going through the hassle of importing them as parents and adjusting them in QuickBooks Online. Using a colon when you import accounts with sub should do the trick! See Import a chart of accounts for details. You can quickly find and manage your reports through the redesigned Reports Dashboard. You can also get more insights about your business with improved and additional new reports. The new Reports dashboard (landing page), which helps you find the reports you need faster, is now available outside Labs. Access it by selecting Reports from the left menu. Previously, income transactions without a specified customer show up in the Not Specified line of the Expenses by Supplier Summary report. To correct this, we’ve fixed the Supplier filter so it now defaults to All and only expenses transactions without an associated supplier will show up in the Not specified section of the report. We now have additional filter for Customer Detail report to help you determine how each customer type performs. We are updating the Tax Centre to ensure compliance and accurate reporting of BAS/IAS. You can now add tax codes to the customer information page. When you create transactions, this tax code will auto populate when the customer is selected and will override any tax codes attached to Products and Services. See Set up default customer sales tax codes for details. Journal Entries are now posting on Sales Tax Centre. This enhancement should prevent previous issues when there are differences between the amounts posted in the Trial Balance (which includes the JEs) and the amounts displayed in the Sales Tax Centre. We continue to improve the overall look and feel of QuickBooks Online for easier navigation and effortless completion of your day-to-day bookkeeping tasks. Admin and Accountant users in all QuickBooks Online versions can now easily find deleted/voided transactions with the "View deleted/voided transactions" link in the Filter section of the All Sales list. Selecting the link directs users to the Audit Trail report with the correct filters (Voided/Deleted transactions) already set so you can quickly find the transactions you need. Action column for All Sales and All Expense Lists now includes options to Void, Delete, or Copy. This will help save time as you no longer need to open the invoice, bill and other related transactions then select More to perform these functionalities. When creating new items, you now have the "Add new" option at the top of the account list drop-down. This allows you to create a new account without leaving the Product/Service information page. Using the keyboard to navigate QuickBooks Online? Then this is great news for you! With improved visibility and flow of tabbing in browsers, you can now easily move between fields on transactions using the Tab key. We've made the data and formatting consistent for import and export list functionalities. This enhancement makes exporting and then importing customer and supplier lists easier and error-free. We're updating various screens to have fixed/frozen headers so you can scroll down a long list and still see what the data is within the columns. Some examples are your Chart of Accounts, Banking screen as well as the Sales and Expense Transactions list. 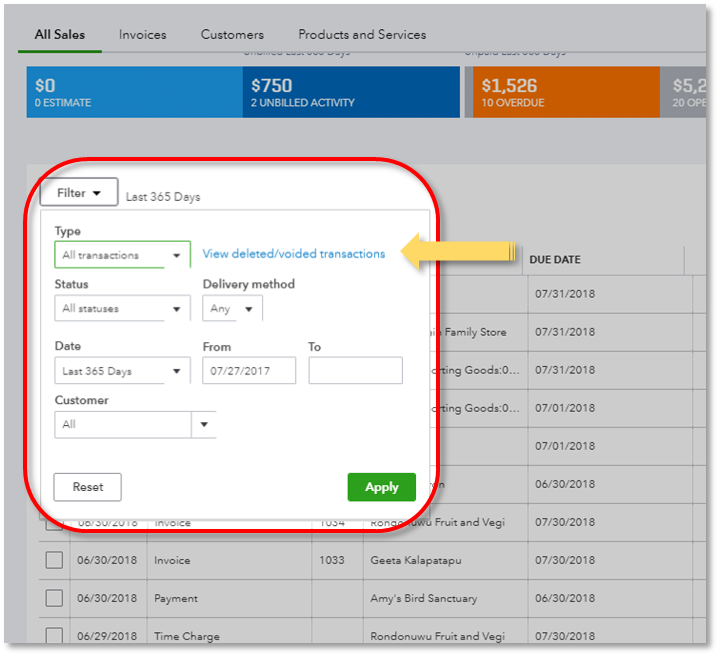 The target icon is larger and aligned correctly on the column border so you can easily grab a column on your invoice to resize it. Not sure what the Activities box is for? Improved ghost/description text gives you a better idea about the Activities box so you can quickly decide on the type of information you can enter in it.